The Zig Zag brand has been around for more than a century. Their machine made cigarillos are produced with a special blend of tobaccos from Dominican, Nicaraguan, and Honduran regions. These filler tobaccos are rolled in natural wrappers that burn slowly to produce a long-lasting smoke. Although these cigarillos are machine-made, their excellent construction makes you feel as if they were hand-rolled. Zig-Zag machine made cigarillos have proved to be very popular and have become renowned for their strong taste and slow-burning qualities. The resealable nature of their two-packs also adds to the convenience and guarantees a fresh cigarillo. Zig-Zag machine made fruit flavored cigarillos are packaged in air tight resealable pouches. 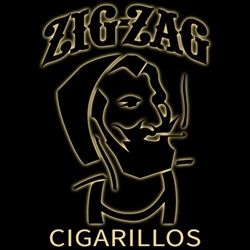 Look for your favorite flavor of Zig-Zag machine made cigarillos below and try them out today. Cigar lovers from around the world have fallen in love with this classic brand. Smokers Discounts believes you will love them too! We’ve made it easy and affordable to buy machine made cigars online. Call us for more details!